After all the posts about possible locations of life in the solar system, we now have word from a NASA scientist about where we will most likely find life. And that is Enceladus. So, why Enceladus? Well, we now know it has hydrothermal vents, which are an excellent place to look for life. It also has plumes of water coming from geysers near the south pole. We can analyse the composition of the water quite easily. However, there are problems. Cassini isn’t equipped to detect the right kind of molecules. Also, there are no planned missions set to be near Enceladus. It’ll have to wait. Just days after posting about five places in the solar system that could support life now or in the past, it was announced that Saturn’s moon Enceladus may very likely have hydrothermal vents. And they’re hot. If confirmed, this would mean that only two places in the solar system are known to have them, Enceladus and Earth. 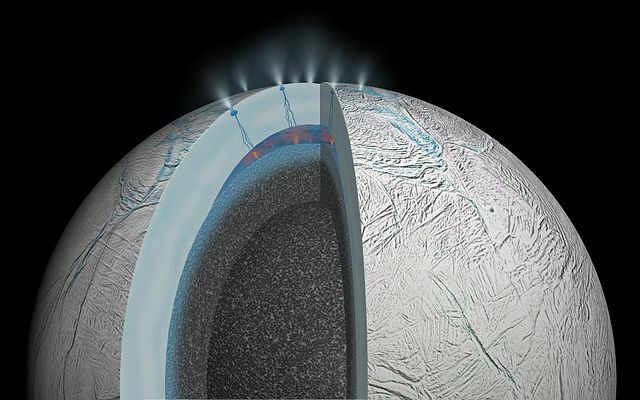 Artist’s concept of hydrothermal vents at Enceladus’ southern polar region. Courtesy NASA/JPL-Caltech. Jets of water vapour have been observed at the southern polar area of Enceladus coming from around 100 cryovolcanoes. The “tiger stripes” found on Enceladus are in this region. 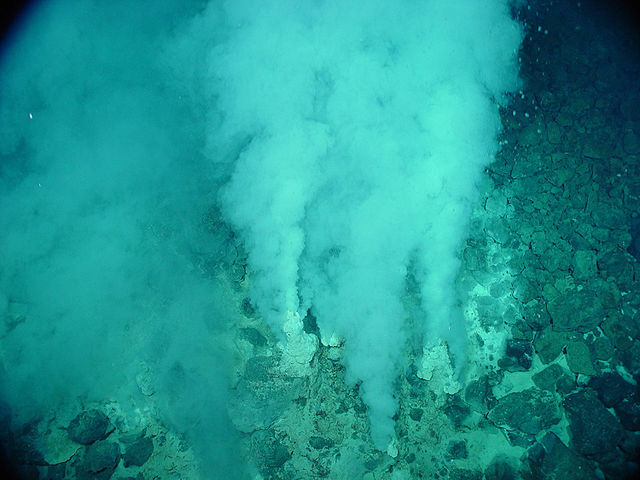 Hydrothermal vents near the Marianas Trench. Courtesy of NOAA. Hydrothermal vents are wonderful places to find life that doesn’t necessarily need oxygen to live. It’s hypothesised that life could have formed around these vents on prehistoric Earth, as they are teeming with life. Knowing this, my initial assessment of Enceladus’ possibility of supporting life has gone up quite a bit. This is very exciting news. Cassini will pass by Enceladus only three more times. Hopefully more information will be discovered. Earlier today, I posted a poll about where life could exist in the solar system. It seems Mars is quite popular. You can still vote in the poll with your answer. But now, I’ll examine each of the worlds and you can see what I think. Keep in mind that I am an expert. Okay, not an expert, but I do have a degree in astronomy. So it is my area of expertise. 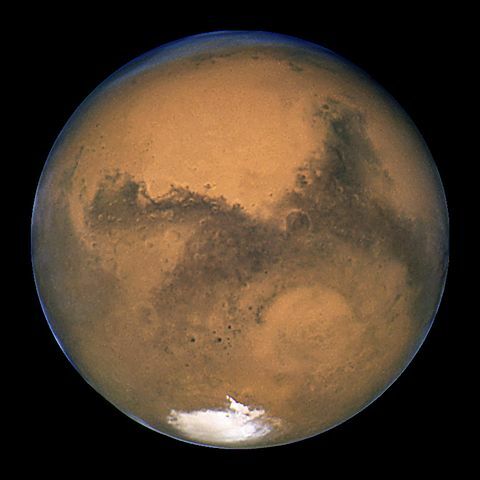 Mars is the best-known planet in the solar system other than Earth. We’ve had many probes go there, rovers explore the surface, and it’s one of the easiest to observe from Earth. It’s a cold, dry world with most of its water locked up in the polar ice caps or underground. There has been evidence of sudden outflows of liquid water, though it couldn’t last long on the surface, but maybe there are aquifers. There are underground glaciers. There’s a chance there is life in the aquifers. Maybe there isn’t life now, but there may have been early in Mars’ history, as it’s recently been estimated that an ocean covered 20% of the surface. We know it had a wet history. Chances of life now? Quite low. But much better in the past. 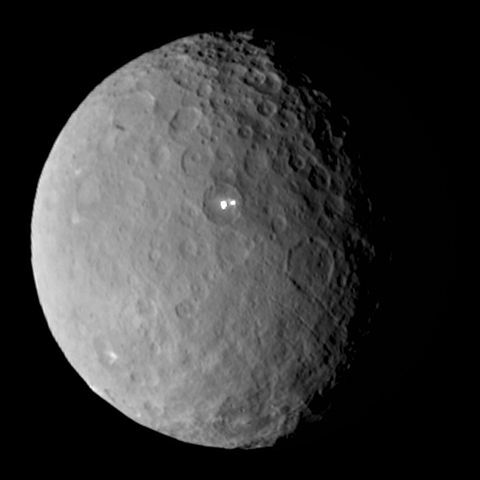 We’ve only been studying Ceres up close for a very short time. We don’t know much about it, but there’s a guess about the internal structure. There’s likely a rocky core with a thick ice mantle. That’s covered by a thin dusty crust. Liquid water could exist if it’s warm enough inside. Water vapour was seen in January 2014, so it’s possible there is some sort of icy volcanism or geysers. What we’ve seen of the surface so far shows that it’s rather dark, but a couple bright spots could be ice. Chances of life now? Probably quite low. This icy moon of Jupiter has been of particular interest for a very long time. It’s almost completely smooth, covered with water ice, and it shows evidence of an active surface, similar to the Arctic polar ice cap of Earth. Thanks to tidal forces exerted on it by Jupiter and other moons of Jupiter, it’s kept warm. That means there’s most likely a vast liquid water ocean under its icy crust. It’s also very likely that there’s underwater volcanism, similar to what we find on the floor of the Earth’s oceans. Those hydrothermal vents are teeming with life, and may give Europa a wonderful chance of supporting simple life, or even some more complex marine life. Because of the thick icy crust, it’s difficult to see what’s beneath. NASA’s recently had a proposal to explore Europa approved, so we could have this chance soon. Chances of life now? Not unlikely, but there’s a decent chance. The second largest moon in the solar system also happens to be the only moon in the solar system to support a significant atmosphere. In fact, it’s more dense than the Earth’s. The surface of Titan is water ice with liquid hydrocarbon lakes and rivers. It rains and snows ethane and methane. While Earth has a water cycle, Titan has a hydrocarbon cycle. Titan even has cryovolcanoes that may be active. The composition of the atmosphere is said to be similar to early Earth’s, which makes a lot of people excited. However, Titan is extremely cold. There’s also likely a subsurface liquid water ocean, so it could be similar to Europa in that aspect. But on the surface, it’s unlikely we’ll find any life similar to what’s on Earth. Chances of life now? Probably low, but if there is any, it’s probably unrecognisable. This small moon of Saturn has made planetary scientists very excited. It may be small, but it’s active. It has liquid water under the surface. We know this almost for certain, because it has hundreds of cryovolcanoes in the south polar region spraying out water vapour and other substances such as salt (NaCl). It could have a large salty underground ocean. Organic compounds have also been detected, which makes it an even better candidate for life. Chances of life now? There’s a decent chance, quite similar to Europa. So, which places have the best chances of life now? I think Europa is number one, though Enceladus may have a good chance, as well as Titan. All three likely have subsurface liquid water oceans. In the past, Mars could very well have had life. We just need to find the fossils if it did. However, in all cases, it’s quite possible that life is single cellular, though Europa’s got a remote chance of multicellular life. So, with this said, what do you think now? Where do you think life could be hiding? Or do you disagree with me? Let me know in the comments. Where Could Life Exist in the Solar System? It’s an exciting year in space exploration as Ceres is now being investigated and Pluto will be seen for the first time in July. These may also be the last large objects to be explored in the solar system for a very long time. But not to worry, the only other large objects are quite far away, though I’d love to see Eris and Haumea especially. Mars is quite promising, but mainly in the past. Ceres needs to be examined more first. 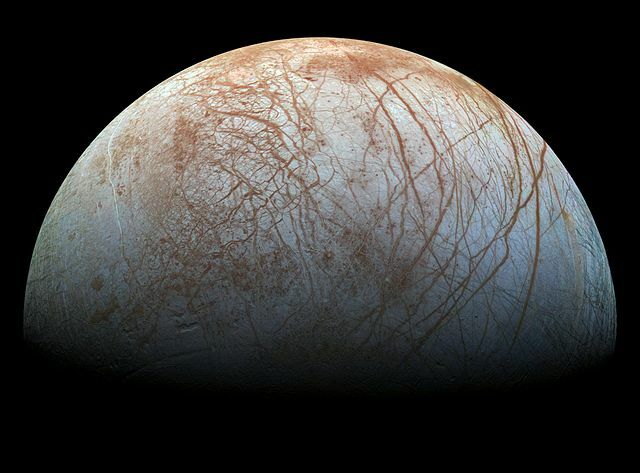 Europa has liquid water oceans. 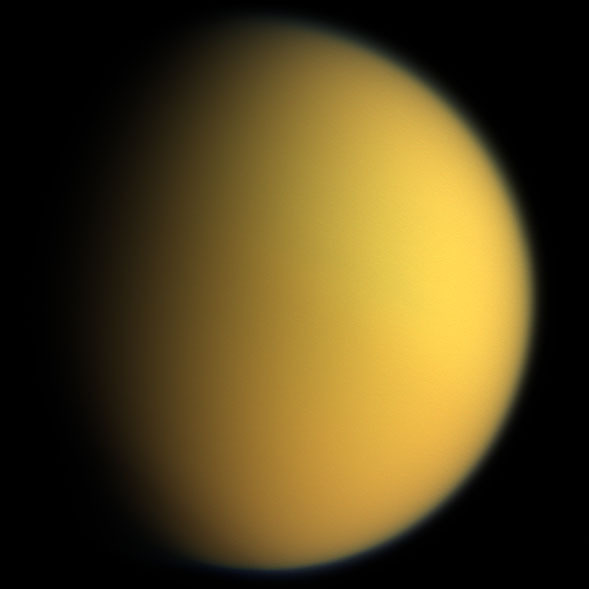 Titan is a very different world, but has conditions similar to early Earth. 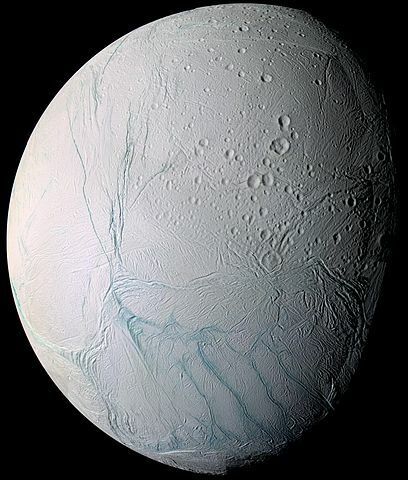 Enceladus also likely has liquid water under the surface. These five are of particular interest at the moment. Which world do you think is most likely to support life? Vote in the poll below and leave a comment explaining your choice. I’ll make a post later on examining each of these worlds and making my own conclusion. I’m Going to Be a Student! Well, sort of. I’m actually going to be taking a couple of free university courses online at Coursera. The first one starts on January 20, 2014, and is only 5 weeks long. 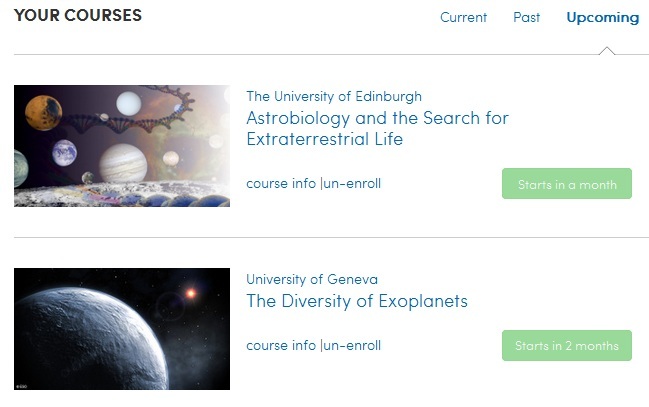 I’ll be studying about astrobiology and the search for extraterrestrial life. I’m using this as research for Ariadne, and hope to get some good information about it. It’s taught by a university professor at the University of Edinburgh in Scotland. The second one starts in March (exact date unknown), and is about the diversity of exoplanets. Also being used as research for my books. This one is taught by 7 professors at the University of Geneva in Switzerland, and it’ll last 6 weeks. Each of these courses will only require 2-4 hours of work a week, including homework, watching videos, and quizzes. At the end of each course, I’ll actually get a Statement of Accomplishment from the universities and signed by the professors. What does this mean? Absolutely nothing. But it’ll be useful information, and will help me improve the science of my novels. Do you ever wonder what plants on alien worlds would look like? The answer may be in the type of star it orbits. Red dwarf stars give off little light and heat, so plants would need to absorb as much light as possible, according to a preview of an article I read online. It makes sense that they would appear black. F type stars are quite bright and would likely need to reflect a lot of light. Shiny leaves? But what colour would they be? Apparently, green, yellow or red. Maybe anything in between, too. This makes it interesting for creating new worlds for science fiction. Knowing the spectral type if the star gives you an idea about what colour the plants may be. Going beyond that, it may give an idea about what wavelengths animals can see. In my planned sci-fi novel, the star I chose is a bit younger than the sun, but a G type star. The plants are likely to be green. But I’d love to see planets with plants of many other colours.